To a group of movie investors, Keeper of the Pinstripes sounded like an ideal business venture. Capitalizing on nostalgia for old-timers Yankee baseball, the film was to depict the “interior and exterior of the ‘old’ Yankee stadium [for one] final public appearance,” and tell the story of “a mysterious room hidden within the depths of Yankee Stadium where some of baseball’s greatest heroes would find solace.” Coupled with this poignant plot line, investors had been told that Josh Lucas would star in the film as Yankee captain Thurman Munson– a recipe for box office success. More than two years after the film’s scheduled release date, Keeper of the Pinstripes has yet to begin production. Earlier this month, the investors, KOTP I/II, filed a lawsuit in New York State Supreme Court, claiming the film was a sham that cost them $565,000. Plaintiffs KOTP I/II claim that since July 2009, they have delivered amounts ranging from $65,000 to $125,000 to the filmmakers. According to the complaint, in August 2009 two of the defendants Joshua Newman and Alfred Zaccagnino formed the entity Keeper NY to divert funds from the enterprise supposedly making the film, undermining any and all legitimate business efforts on the plaintiff’s behalf. Plaintiffs assert that at no time did they authorize the transfer of their investment monies to Keeper NY. Plaintiffs also allege a number of misrepresentations by the defendants. In August 2009 plaintiffs received a letter in which the defendants claimed the investment threshold of $1.5 million had been met, contractually requiring additional payments from the plaintiffs. According to the plaintiffs, investment monies were deposited into various bank accounts controlled and misused by the defendants for purposes unrelated to Keeper of the Pinstripes. The complaint additionally claims defendants “made extensive undocumented debits and withdrawals from the corporate accounts for personal gain and have engaged in a pattern of self-dealing to the detriment of the plaintiffs.” Claiming breach of contract, fraud, conversion, and breach of fiduciary duty, KOTP seek an accounting, compensatory damages and special damages. While Pappas’s past indictment does not conclusively suggest Newman’s innocence in this matter, one need not look further than the Yes Network’s “Yankees Magazine” for compelling evidence that Keeper of the Pinstripes was not entirely a sham as the plaintiffs contend. 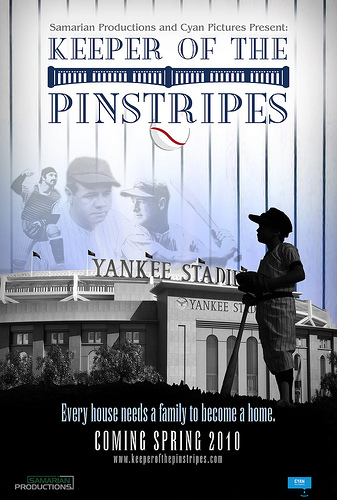 In an episode originally aired on December 3, 2008, host Nancy Newman described the upcoming Keeper of the Pinstripes film as a “blockbuster film in the making” and that it was to begin production shortly. Ms. Newman went on to explain that the Yes Network would keep fans updated with the film’s progress and mentioned that the film was endorsed by the Yankees. Defendant and producer Alfred Zaccagnino appeared in the episode, describing the film’s plot and his confidence in Keeper of the Pinstripes becoming “one of the greatest classics ever made.” To-be leading man Josh Lucas also appeared in the episode, as did the film’s director Robby Benson. While the episode does not refute allegations concerning the comingling of funds into various bank accounts or the defendant’s alleged failure to refund money and pay back their loans, it does strongly suggest the film itself was not a sham. The validity of the plaintiffs arguments will not be answered, of course, until the case goes to trial. Should the allegations be true, does this explain why such a widely anticipated film was never created? With the endorsement of the Yankees, a pre-production teaser of the film on the Yes Network, and the agreement of famed Hollywood actor Josh Lucas to play the leading role, the real question to be answered at trial is what really went wrong in the making of Keeper of the Pinstripes?